This year marks the 50th anniversary of the last capital punishment carried out in Australia: the hanging of Ronald Ryan. On 3 February 1967, amidst widespread outrage and protests, Ryan was hanged. Even some of the jurors who had found him guilty signed petitions calling for the sentence to be commuted to imprisonment. Many questions about the case remain unanswered: Ryan was convicted of murdering prison officer George Hodson during an escape from Pentridge Prison, but did he really fire the fatal bullet? And, given that it was the first enforcement of the death penalty in Victoria in 20 years, was Ryan’s hanging a political ploy by a premier campaigning on a tough stance on law and order? Here, playwright and author Barry Dickins shares some insights on what drew him to Ryan’s story, and the unique voices he included in the research for his new book, Last Words: The Hanging of Ronald Ryan. What of course drew me to the Ronald Ryan story was the horror of a remembered execution and that rememberers needed to speak out in order to go upon the public record to clear thoughts and crippling emotions once and for all; the saga of the 18-month wait for Ronald was trauma enough but to endure promises of a reprieve only to see that dashed too seems to anyone, writer or just public minded citizen, something approaching barbarity during the flashy ’60s. Ronald was sacrificed to guarantee election victory and as a writer I needed to set down my feelings for our reading public. Thank God for books! The little known aspects of Ronald that are missing is his voice and, since he was never interviewed, the only record of it is included in the recollections of his three daughters whom I interviewed in my research; my friendship with Prison Governor Ian Grindlay and his wife Audrey also proved invaluable because of the incredible soulfulness of their anecdotes and whimsy of shared tales when I was a guest of theirs at their home dining table. Their secrets they openly shared with me as they liked me and they trusted my outlook and knew I would be honest with all my writing. The best lesson learnt by me was the value of listening to the daughters of Ronald with greater duty of care in order to secure their sacred recollections for the heart and soul of the book; the deed of human presence and human listening is what gave the book its life and my imagination is the fellow escaper. 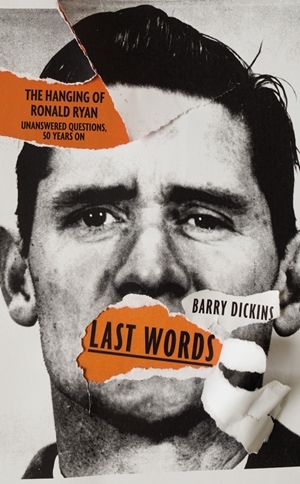 Last Words: The Hanging of Ronald Ryan is out now.